Ring in the New Year with a blast! 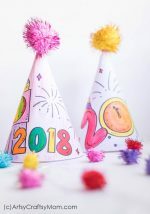 Here are some DIY New Year’s Eve Party Ideas for kids that look great, are simple to make and easy on the pocket too! These delightful lines from Ogden Nash reflect exactly how we’re all feeling this time of the year! A New Year is something everyone looks forward to, as a chance to start over and do things anew. And it’s the same for adults and kids alike. So why should adults have all the fun? This year, plan a great New Year’s Eve party for the little ones too! Of course, if the kids can’t stay up till 12, that’s perfectly okay, just have the party for 12 noon!! What matters is that the kids enjoy themselves and don’t feel left out while the adults party. Yes, it’s the holiday season and we’ve already spent a bomb on gifts, so you might be wondering how to make this possible. Don’t worry – where there’s a will, there’s a way! And the way we’ve found point towards these DIY New Year’s Eve Party Ideas for Kids – featuring food, decor and more! The Suburban Mom has a great idea for New Year’s Eve decor and it’s surprisingly easy to make! If you can’t find number stickers, you can also use simple cutouts and stick them yourself. You can also go completely DIY by making the numbers out of black chart paper! Most centerpieces are just decorative, but this one from Martha Stewart has a purpose too! Arrange a bunch of noisemakers on a pretty cake stand surrounded with any tinsel or other leftover Christmas decorations. When it’s time to celebrate the New Year – let everyone pick one up and make some noise! This garland from Vicky Barone is a breeze to make – even kids can do it! All you need is stiff black card stock or chart paper and letters. Glittery foam letters would be perfect! String them all together and you’ve got yourself a garland! Pinatas are never not fun, and your New Year Eve’s party could use one too! Delia Creates has an absolutely stunning shooting star pinata DIY, that’ll have the kids super-impressed! When it’s time to celebrate the coming of 2018, go ahead and give it a pull! If you’re not in the mood for a pinata or think it’ll be too messy, then go ahead with a disco ball – that you can make yourself! How’s your Day has all the instructions with measurements and everything. So go ahead and get crafting! It’s hard to think of something more perfect for a kids’ party than cupcakes! Down Home Inspiration has some gorgeous looking cupcakes that the kids are more likely to just stare at rather than eat! They’re pretty easy to put together, but minimize the inedible stuff if your guests are too young. Give the kids horns that they can toot and eat as well! Hungry Happenings shows us how to turn basic ice cream cones into colorful, edible party horns. These are going to look so pretty when they’re all done and placed on a tray! Okay, these clock cookies are just so clever! Cookies shaped like clocks, which are filled with confetti! It’s a lot easier to do than it sounds, and the step by step pictures at Repeat Crafter Me are very helpful. Just make the cookies a little thin so they don’t look gigantic when piled on top of one another. Give the kids a break from all that sugar with these crescent dough dippers from Pillsbury. Even if you don’t find crescent dough, I think regular pizza dough should work as well. Shape out ‘2018’ and let the kids go ‘Wow!’ when they look at it! For many people a New Year’s Eve party isn’t complete without some kind of alcohol, but here are some awesome kid-friendly alternatives at Modern Parents Messy Kids! The ideas are really simple to implement and the kids are sure to love all the colors! These party blowers from DIY Candy are simply hilarious! And they’re super easy to make too! Just draw the outline on a white paper plate, cut, color and insert a blower. You’re all set for some fun photos for the party! A photo booth makes a party so much more fun!! 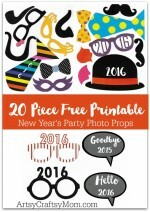 Check out these printable photo booth printables from Cupcakes and Cutlery. Use glittery paper or really bright colors so that the resulting photos look great. This is one activity that’s going to keep the kids occupied for a while! Make these colorful New Year’s Eve party crackers from Moms and Munchkins to give your party that extra POP! This is the perfect way to end your great party – hand out poppers to all the kids and let them go pop! Just make sure you have enough cardboard rolls to make the number of poppers you need. And if the crackers aren’t enough, add some color to your party with confetti launchers! Happiness is Homemade features launchers that’ll literally spread the cheer – along with loads of color and glitter! What’s a party without some noise? And when it’s to ring in a brand New Year, there should be plenty of it! Take the party a notch higher with a DIY Noise Maker that is both bright and shiny and also makes some noise. Check out the instructions at Mom Unleashed. Gather everyone together for a game of Bingo! This popular party game gets a New Year twist at Capturing Joy. Get the full set printable with six different cards and let’s see who wins! This New Year’s eve, let’s pin – not the tail on the donkey’s behind but the needle on the clock! This is a perfectly themed variation on the traditional party game. And you don’t have to make the clock – the printable is all ready for download at Paging Super Mom! Happiness is Homemade has a cute Wordsearch printable that’s custom designed for New Year. Hand out shiny golden pencils and the printable sheets to the kids and let them have a go at it! Let the kids get out and about with this I Spy game – New Years edition! 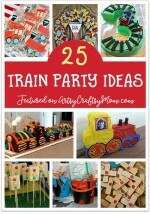 Simply Play Ideas has a free printable that features party hats, balloons, poppers and more. So make sure you have a count of all these lying around! This is THE game that will make your party a super hit – well into the New Year!! Use fluorescent duct tape on bottles and get glow sticks as rings, as shown in A Pumpkin and A Princess. Turn off the lights and get ready for some intense fun! Kids love making stuff that they can later use – whether it is to play with or in this case, wear!! These printable coloring hats are perfect for a last minute activity. Just print out the cards and let the kids color in. Hand them the required craft supplies and let them do the rest! Why not ring in the New Year in royal style – with a crown and everything? Brit + Co has some great ideas for different kinds of party crowns. Kids will love wearing these throughout the party and taking them home too. You can either make multiples of the same style or a mix of everything. There’s no better way to ring in the New Year than with some magic! And we need a magical wand for that, which we can make thanks to the instructions at Hello, Wonderful. Now make a wish and watch it come true! Smart watches step aside, this New Year’s eve is time for a special countdown watch! Hattifant has a free watch printable that kids can color to their liking and then wear and flaunt it in style! You can’t let the kids play with fireworks, but they can still have them on their hands – in the form of rings! Fantastic Fun & Learning shows you how you can make these sparkly fireworks rings in detail. They’re so easy, you can make several in a short time! This idea from Party Delights is genius! 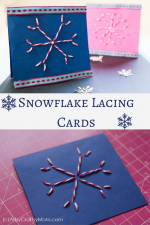 The downloadable printable makes this craft super easy. You can have as many bags as kids, and have each kid open one bag every hour or half hour, whichever is convenient. Fill each bag with multiples of something fun but small – whistles, candy, fun-shaped stationery. Hand out empty bags to each kid and let them keep filling it as each hour passes! They’ll love the buildup! Play dough is always popular with kids and makes a great party favor, but you got to make it special for New Year’s eve! Buggy and Buddy has the perfect solution – celebration play dough! These star shaped glittery favors go perfectly with the entire celebratory theme! These printable favor tags from Happy Go Lucky Blog are so cute! The tag says “So happy we’re POPPIN’ into the New Year together!”. Besides the cute pun, the black and gold color scheme also goes perfectly for New Year’s Eve. Everyone likes playing with bubbles, and when there’s a shiny bubble wand to go with it, it’s even better! These pipe cleaner bubble wands are really easy to make. Attach them to a small bottle of solution and let the kids take it with them. Wish all your little guests the very best for 2018, and what better way to wish good fortune than with fortune cookies? Happiness is Homemade doesn’t just show us how to go about making the glittery fortune cookies, they also have a free printable that you can use to pack them! Do check out these 15 awesome Fireworks Crafts too, to add some extra sparkle to your celebrations. You see, you can have an incredible party without having to max out your credit card! These New Year’s Eve Party ideas for kids should suffice for everyone to have a blast, and ring in the New year with a great memory! I am definately gonna try baloon theme for new year eve. such creative ideas. thanks for sharing.